There were a lot of firsts last night. It was the first The Tonight Show Starring Jimmy Fallon. U2 was the show’s first musical guest. It was the first time U2 performed “Invisible” live in front of audience. It was the first time U2 performed “Ordinary Love” live in front of an audience. U2’s appearance on the debut of the new Tonight Show seemed to last forever, but in actuality it was only 13 minutes and 42 seconds. 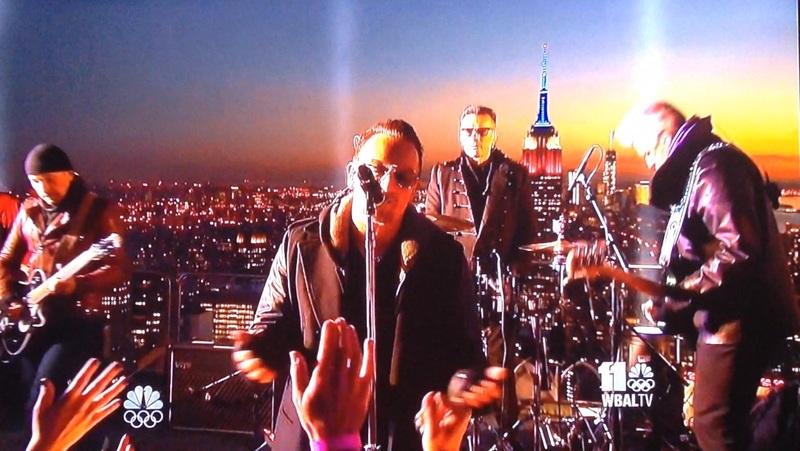 U2 performed “Invisible” 70 stories high on the observation deck of NBC headquarters, the Top of the Rock. The performance was taped in front of screaming U2 fans, most of whom won tickets on u2.com. The band played “Invisible” a couple times on Sunday and a couple of times on Monday, both days taped for the Tonight Show debut. It was a spirited performance, but Larry did not have his full drum kit. I like that he stood up to play the drums, sort of like he did at the B stage or at tip of the heart. Larry was flanked on either side by the Rutgers University drumline. U2 were then inside the studio sitting on the couch talking with Jimmy Fallon, all except for Larry. Not sure why, but Larry chose to sit on the back of the couch instead of on the couch with the others. Maybe because he’s used to being elevated with his drums on stage behind everyone. While chatting, Fallon asked U2 to play their academy award nominated song “Ordinary Love.” They played a beautiful acoustic version, which made me go back to my original opinion – I love this song! I love the passion in which Bono sings it. But I did not love that Larry played a tambourine like Tracy from The Partridge Family instead of playing the drums, but I guess hiding a drum kit behind the couch would have been too much. Although, they could have given him a conga like they did at the church in Harlem in Rattle and Hum. At the end instead of singing “Ordinary Love,” Bono sang “Questlove” for the Roots’ drummer and bandleader. So far 2014, has been a great U2 year with something new each month. In January, U2 were at the Golden Globes accepting their Best Song award for “Ordinary Love.” In February, U2 started off the month with a Super Bowl commercial to raise money for AIDS in Africa with a free download of “Invisible.” Ten days later U2 released the video for “Invisible,” and then their historic performance last night on the Tonight Show. In March, U2 will perform on the Oscars. In April, U2’s new album is supposed to be released, according to Dallas Schoo – although other reports have indicated a June release. A tour is sure to follow. This is going to be the year of U2014 and I cannot wait!! But please Larry, lose the buttoned-up collars! My U2 experience at the Jimmy Fallon Tonight Show. February 17th, 2014. For those of you reading this, my name is Ryan, 20 years old, but one of the biggest U2 fans around. I won’t argue that I know all their lyrics just yet, but I’m almost there. I won’t argue that I’ve seen the most U2 shows, I’ve seen 2. I won’t argue that I know every little detail about the bands’ history, but I do know they have changed my life forever. I got the E-mail that I won 2 tickets into the U2/Jimmy Fallon show on Saturday around 6:30 ish. I was up all night the day before as we all know the winners were supposed to be announced Friday night. I was up until midnight, hoping I would get the email.. but at the time I was losing hope. I do have to mention that I had the original email sent to me via the link at the bottom from two people, Mark Baker and Chrissy Karovic. Their kindness to lessen their own chances, just to help a friend out and get into the competition assures me that there are amazing people still out there. Thank you Mark, and Chrissy. So, as I said, I got the email. Me +1 were GOING TO SEE U2 LIVE at JIMMY FALLONS PREMIER SHOW!! I was ecstatic. I was jumping up and down and screaming Hallelujah! I KNEW IT I KNEW IT I KNEW IT, I shouted, to my mom on the couch who was so not wanting to let me drive to NYC to scout them if I didn’t win lol. From there I decided to call my cousins’ family. Also, my U2Family (as we call ourselves) to celebrate the news! I told them I can take one of you guys! I ended up choosing my cousin Alex Haines, who is closest in age to me and we have been close since we were very young. From that point we got the logistics of how this was all going to happen with driving and etc. I drove myself and him to Philly Sunday night, from about an hour away North. He had a test in his College Class in TEMPLE U, that he had to take before we left. So, Monday as soon as he left class, I picked him up and we left for NYC around 11:30. The Email said to meet at the designated spot at 4PM. The car ride was great, we Blasted INVISIBLE the whole way along with Ordinary Love and all of our U2 favorites I had put on a CD for us. We arrived in NYC around 1:30, found a parking garage close enough to Rockefeller and walked to where we had to go. 4oclock – We make the first move into what would become an amazing time. We waited in that room for a while still all in our original order thank GOD there was about 75-80 of us crammed in this room. Gotta love U2 fans. From there around 445 maybe? We were taken in groups of 15ish to an elevator. This took us to the 67th floor. At that stage we went through AIRPORT LIKE SECURITY. We emptied our pockets, went through a metal detector and even had a dog sniff us for who knows what! From there we were escorted to a holding room that eventually contained all 80 or so of us in our snaking-lines. From there we could look out the window over central park. I wish I could’ve taken a picture it was so beautiful. I thought I may never get this chance again. BUT, they made us all turn off our phones prior to all that. AT SUNDOWN, we re escorted through white barriers that looked similar to the 360 claw material lol, and up 2 flights of stairs to the 70th floor. At the top, the sky opens up and we see what I believe was heaven. THE Smallest stage U2 has probably played on, AND NO BARRIER BETWEEN US AND THE STAGE. (There is no them, only us). At this time, we were still single file, and I want to remind you that me and ALEX were supposed to be 1 and 2, but became 7 and 8. As we came in the security made the line form from left stage to right. THAT PUT ME AND ALEX FRONT AND CENTER. HOW PERFECT! I had my stomach resting up against the stage, I grabbed BONO’s Mic stand which was right infront of me, literally a foot max. the security told us to push as close to the stage as possible so they could have a lane in the back for a camera, WE DIDN’T NEED ANYONE TO TELL US THAT!! I would’ve been on stage if I was any closer. Alex directly to my right. At this time, Dallas, Edge’s guitar tech was on stage getting things tuned up as well as Sam, (larrys guy) and Adam’s guy. They ran though this for about 20 mins maybe. OUT OF NO WHERE, comes JIMMY FALLON himself!! On stage! He comes to the front and gets the crown pumped saying this is HISTORY WERE MAKING!! And tells us all to go NUTS!! I reached my hand out and he GAVE ME A FIST BUMP!! Such an awesome guy, who you are oddly not star struck by, but someone you feel have known forever! From there EDGE LARRY AND ADAM come on stage!! Larry stands behind his new all Yamaha Kit, and looks at what will be a great view for him to play all night! He looks at me. I YELL “LARRY YOU”RE THE MAN! He mouths to me “NO, YOU the MAN!” people around me saw and went nuts!!! If you read my last review, you know I LOVE LARRY MULLEN JR. He’s my inspiration as a drummer, and the reason I started drumming. I can drum most of the U2 songs! Now including INVISIBLE! JF introduces the band which you see on camera, and they rip into Invisible, Bono appears from right stage and becomes a neck breaking view for me. LITERALLY. Straight up!! MY shoulders are killing me today from looking UP! MIND YOU I WAS 70 Floors HIGH! BONO sticks his leg on the PA monitor right in front of ALEX and sings right into my FACE! WTF!! THAT WAS SO UNREAL, I can’t believe it happened even to this moment. I can see his blue eyes, through his Blue aviators, seeing him looking at me and then the crowd of fans that are there to adore him and his ROCKING new SONG! EDGE is killing it with his Gretsch guitar! He looks the coldest to me out of everyone. Adam is jumping around and having a great Time!! LARRY with his military Look and precision drumming gets me every time. AFTER the first take, Bono wanted to do it again to get it perfect. JF comes our again and gets us pumped and says to go NUTS AND DO NOT STOP !! IT LOOKS GREAT ON THE SCREENS he says! So, as if on repeat, they did the same thing again but more INTENSE!!! Bono was in our faces, we were in his. We sang EVERY word and did just as FALLON said. 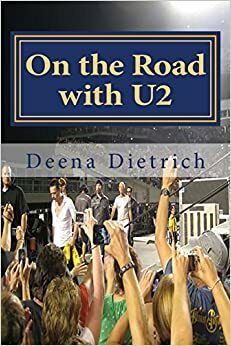 At the conclusion of the song, the band quickly started to put guitars down and begin to get shooshed off stage, but BONO did take time to slap some hands INCLUDING MINE! HE grabbed my hand and we shook for a good second or 2! Felt like forever! Then Larry gets from behind his KIT! Looks at me! I gave him a wave and motion for him to come over with a smile. He nodded. CAME RIGHT TO ME, and SHOOK MY HAND! At this point in time, im not sure if BONO shook Alexs hand or not it was all a daze. Same with Larry for him! ADAM and Edge slapped some but not ours.. and they got off stage, and quickly out of sight. THAT QUICK IT WAS OVER, BUT IT WAS ONE OF THE MANY MOMENTS U2 HAS CHANGED MY LIFE. Lastly, we were then lead out of the roof down the stairs, down the elevator with wordless U2 fans, it was almost silent. What just happened to us? Was it real? Were we just in heaven!!!!?? From there we went to the streets of NYC where me and Alex got two FIVE GUYS burgers and digested more than food. We still can’t wrap our head around what happened. Had we not went to get food and a bathroom break, we wouldn’t have been front and center. The weather was cold but not windy so it was perfect. (we were actually provided hand warmers, didn’t even need them). Spent the day with my cousin and had the MOST amazing time. THIS MAKES ME WANT A TOUR NOW! Well, I have been truly blessed in the past couple months and I do not take it for granted. I appreciate everything U2.com has done for us even though not everyone won, I love the friendship U2 fans have and the loyalty and sacrifice between us. Through experiences like this, you slowly begin to realize what U2 songs are about. Belief, Love, and respect for one another, gets you to the furthest destinations in life. I will carry these morals with me for the rest of my life long after U2 is singing them to me. We all try to be the best person you can be and also make the people beside you even better. Thank you for reading this, LOVE YOU ALL!